We knew we had a 384 km (240 mile) drive and so we tried to get an early start. But it was still 9:30am or so by the time we hit the road. We had to stop for more groceries because we are going to be six days in Etosha National Park. As we were exiting the park gates, the park officer asked which direction we were going. We said we were heading for Etosha National Park, and she asked if we would mind dropping a lady off at the next town along the way which was Otjiwarongo. About an hours drive. We said sure, and were happy to meet a local. But it turned out that she only spoke Afrikaans and so it was a little difficult to communicate. But we found out her name was Emma, and she was quite happy to ride in silence the rest of the way to town. Heading north on the B1 towards Otjiwarongo. Not the most exciting scenery. It seems that there are long boring stretches of highway between attractions in Namibia. Now, the attractions are totally worth it when you get there...but the drives are long. That must be why the speed limit is 120 km/h (75 mph). We stuck to 90 km/h though...we are in no rush. We needed fuel again, and as we entered town there was a Shell gas station. Bought N$600 ($64.80) worth and that almost filled us up. Emma said she would get out there and thanked us and said goodbye. We then stopped at a Spar Superstore. Otjiwarongo is a small city of about 70,000 people. And this store sells everything. Just like any modern grocery store in Canada or the U.S. So, we bought around $60 worth of groceries and that will do us the week. As I said before, meat and chicken is inexpensive compared to Canada. We splurged...bought lamb chops and sirloin steaks! And a whole roast chicken (it was tiny though!) for lunch for $2.35! It was a Sunday though. Note to self for future reference...stores will not sell you alcohol on a Sunday! So while we still have some beer and wine, it is not enough to last us six days. Oh well, live and learn! On a Sunday, there's not much going on in Otjiwarongo! Everyone was at the Spar grocery store. We see several other "tourists" stocking up at the grocery store. And, some of the locals asking for money, but not many really, and the only one we give a dollar to was a young lad with a sign up sheet to send his school football team to a tournament in Windhoek. he was enthusiastic, polite, and well spoken. Hopefully the money goes to where he said it would! We needed more cash ourselves. The ATM's seem to only allow a maximum of N$2,000 ($216) and we knew we would need more anyhow. Stopped at one machine towards to exit out of town, and there was an armed guard there but he said the machine was out of order. So we stopped at the town of Otavi and found a bank with a working machine. Again, a guard at the machine. But it all worked fine. Ruth took this pic of some locals while I was at the ATM. 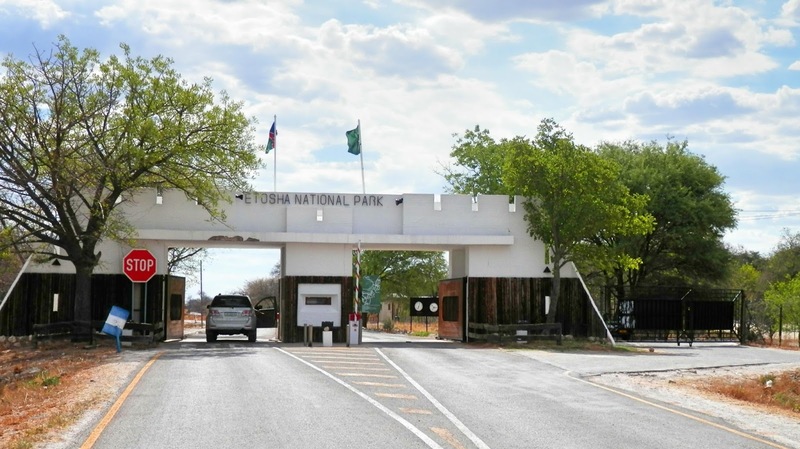 Made it to the eastern gate to Etosha National Park just after 3:30pm. There, they asked how long we were going to be in the park, we had to fill out our permit card, and then were told to carry on through to the Namutoni Campground where we have reservations for three nights. Von Lindequist Gate. The eastern entrance to Etosha National Park. Five minutes into the park, this fellow was here to greet us! That's all for now, but I'm going to add a little more later if you can remember to check back! I'm hooked, I'll be back to read more! Another super day of travels and adventures. Your posts make my day! Keep 'em coming! And just when Ruth is wearing her giraffe necklace (too bad he's upside down!). Kevin, now you're a FREE TAXI SERVICE !!! THE WORD WILL GET AROUND !!! Hope it all goes well and y'all have a HAPPY DAY !!!! 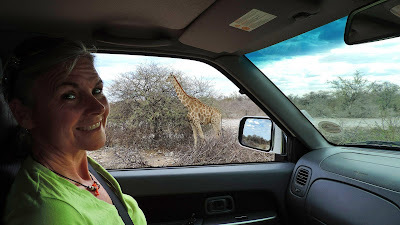 Nothing like camping with the giraffes and meeting the locals. It's not just the animals and people that make your trip exciting. Have you observed that your shadows now point south? And beginning this Saturday, the sun will literally be directly overhead---so you may have no shadow at all! Then as the December solstice approaches, if you look closely, you might even see short mid-day shadows actually pointing north, of all things. I think you were kinda lucky that there were ANY stores open on a Sunday. Sometimes there's "no Sunday shopping". You'll just have to stock up on beer a little later. Interesting to know what's available. Too bad you didn't speak a bit of Afrikaans, but that's the way she goes. My sister-in-law and husband lived in Zimbabwe many years ago would tell stories of giving rides whenever they made the 50 mile trek into Harare. It's usually best if there's an "introduction" or you know the person. Otherwise, no dice. Wow! Have an amazing time in Etosha. It was unforgettable for us. Do hope you publish a photo of a bird or two. I'm happy to ID most of them. I'm pretty good. Great picture of Ruth with the giraffe. Very special. Hope you stay at the campsite with the nightime waterhole. We saw the black rhino come and drink there. How wonderful!!! :) Loving all the photos! Giraffes are my favorites and it's the first thing you see. Oh my, lucky you guys!! Well done. What a trip!! You are doing very well.....how much better can it get? Gotta' love a well stocked Spar, just maybe not on a Sunday. What a trip you're having. Any interesting food stuff in the stores? In Namibia no liquor is for sale on weekends after 2pm Saturday and all day Sundays. Also not on public holidays. Here's my ATM trick: We learned that even though the ATMs limit the amount you can take at once, you can just stick your card back in a second time and take out the max again before leaving the ATM. And look for Standard bank (blue signs) - they usually allow N$2,500, so then I can get N$5,000 at one shot. Exchange rate has gotten really good in the past few days! With the ATM's you can often withdraw the maximum then immediately put your card back in for a second withdrawal. South Africa the same in that alcohol is not for sale on Sundays - you have been warned !